North Korea will not be required to provide a complete list of its nuclear weapons and missile sites before a second summit between President Donald Trump and North Korean leader Kim Jong Un, Vice-President Mike Pence told NBC News Thursday. 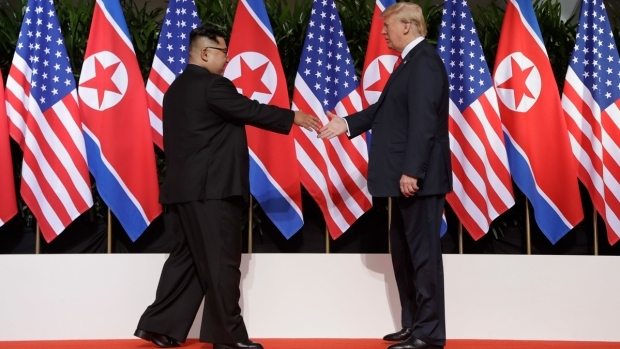 The U.S. has pressed the North for information on the entirety of its nuclear operations since an initial agreement for denuclearization on the Korean Peninsula was reached in June. But the Kim regime has refused to provide details of the nation's operations and postponed scheduled meetings with Secretary of State Mike Pompeo in New York last week. Now, the second summit between the two leaders — slated for after the New Year — will be where a "verifiable plan" to disclose the sites and weapons must be reached, Pence said. This week, a report from the Center for Strategic and International Studies outlined a number of missile operating bases that the North Koreans have continued to develop since the Trump-Kim summit five months ago.